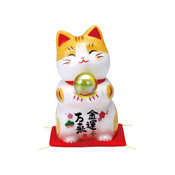 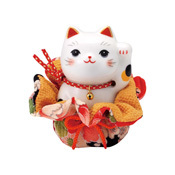 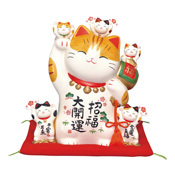 An Ebisu Maneki Neko with its right hand raised has been popular since ancient times in fishing, commerce and farming as Ebisu is a god that brings a good catch of fish, prosperous business and a rich harvest. 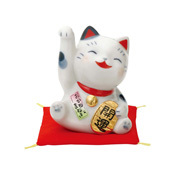 A Daikokuten Maneki Neko with its left hand raised has also been popular since ancient times as Daikokuten is an indication of wealth and fortune, and brings business prosperity. 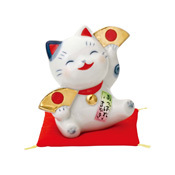 In Japanese "suehirogari" means "spread out like an open fan" and also refers to offspring prosperity and prosperous business at the same time. 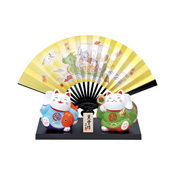 The treasure ship drawn on the fan is a New Year good luck charm and it is said that, if you place one under your pillow on the night of January 2nd, you will have good dreams.